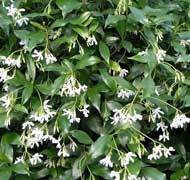 This beautiful evergreen vine has glossy leaves on stems to 6 m (20’). The fragrant 2 cm (3/4”) clusters of flowers are cream in color with a darker throat that changes to yellow as they age. A warm sunny location is required for them to excel.